The exact spot where Southern 242’s wreckage is buried remains a mystery – but it can be found in a very public place. After I commenced telling this story, I found out that the wreckage has in fact been an unmarked grave site for nearly four decades. Every year, many thousands of people unknowingly visit this forgotten tomb during games at the Samuel U. Braly Sports Complex in Dallas, GA. How is this even possible? The story begins right after the plane tragically lost both engines in a hailstorm on April 4, 1977. Within hours of the crash in New Hope, GA, the National Transportation Safety Board had recovered the flight data recorder and sent it to Washington for analysis. By the end of the week, the NTSB had transported the remaining parts of the airplane that were needed for the investigation to a secure hangar in Atlanta. 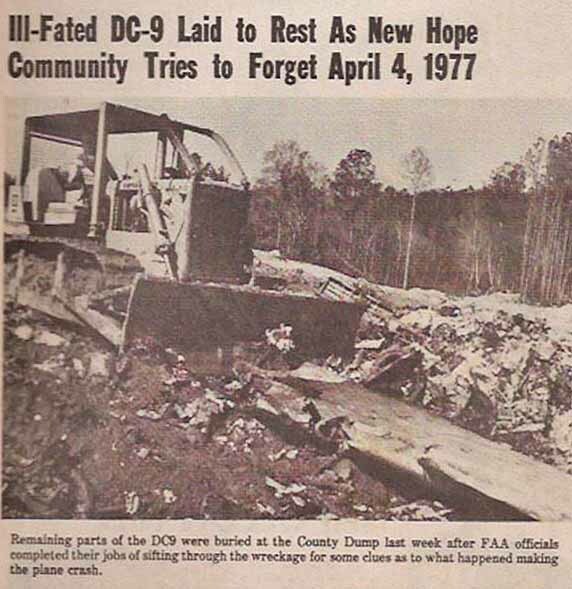 The rest of the aircraft was taken to the county dump in nearby Dallas, GA and quickly buried, including the charred section of the fuselage in which so many passengers had tragically burned to death. By mid-April, the crash site had reopened to traffic, the telephone poles had been repaired, the police barriers were down, and there was talk about “getting things back to normal.” New Hope had survived, and the tight community that had pulled together after the crash was made whole again – but a closer look paints a different picture. Parts of the crash zone, which stretched the length of six football fields and more, were contaminated for months afterwards with the horrible detritus from the accident. The broken tree limbs had been removed and the ground was nominally raked, but the violent remains from the crash cast a heavy shadow over the plane’s final resting site. Flies swarmed over and around the curious gawkers, crash-trolls, and rubber neckers who invaded the grim scene, morbidly seeking out souvenirs and often finding more then they had bargained for. It was eerily reminiscent of the bloody Civil War battle fought there in May of 1864. Southern Airways promised to remove the remaining top soil, but they never did. The wreckage lay undisturbed over the next decade beneath a growing pile of rubbish. And then in the mid-1980’s Paulding County decided to close the landfill and build a much needed athletic complex at the same location. So they capped off the area with a high-density covering, added an additional layer of top soil, and created a series of ball fields called the Samuel U. Braly Sports Complex. Two decades later, the fields began to sink back into the landfill, so the entire area was regraded. The new and improved Braly Sports Complex currently boasts fifteen soccer fields, a modern pavilion, and several well-equipped playgrounds for the younger brothers and sisters. 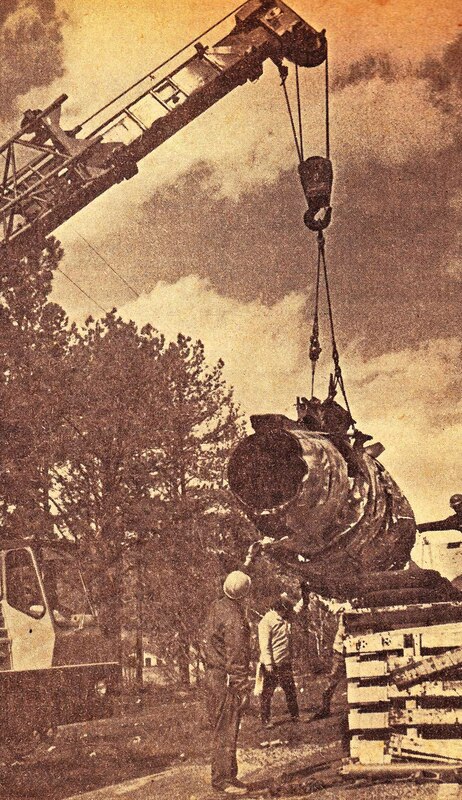 But the burned fuselage from the aircraft was enclosed inside that dry tomb when they sealed off the dump, and it remains buried there to this day. Although there is a small plaque honoring Southern 242’s victims next to the Civil War cemetery near the crash site, many people feel that a larger and more significant memorial needs to be built. 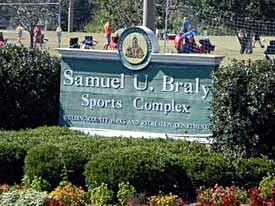 I believe the Samuel U. Braly Sports Complex in Dallas is the perfect location for that memorial. It’s appropriate because the site contains the buried wreckage that held so many of the victims who lost their lives on that tragic day. It’s practical because the sports complex is accessible, there is plenty of free parking, and the grounds are well maintained. And it makes sense because the location will allow the memorial to educate Braly’s many visitors about the worst aircraft disaster in Georgia history. This entry was posted in The Tragic Crash of Southern Airways Flight 242 and tagged Samuel U. Braly Sports Complex, Southern Airways Flight 242. Bookmark the permalink. This tragic crash absolutely deserves a more significant memorial, and the Samuel U. Braly Sports Complex is clearly the most suitable location. Very well said. I will remember that day forever. I still remember where I was and what I was doing when I got the news. As part of the Southern Airways Family, Flight 242 will always remembered very deeply in our souls. The horror of having a double flame-out on a 2 engine aircraft is impossible to imagine, but it happened. Captain McKenzie and First Officer Lyman Keele were piloting the flight. Lyman left a wife and 3 children. I had not seen these pictures before, and I did not know where the aircraft pieces were buried. I think often of how this accident has changed that town. I have even wanted to visit the site. In any crash, we are family in the industry. Thank you for the story. We lived the Marshall Football Team and this one during our 27 years with Southern/Republic/Northwest/Delta. Thanks Cliff, for informative info that I had never heard. Just like J. Riley, whom at one point I worked with, I remember that day, what I was doing when I heard of it, and how I got involved with it for the next few days….